I'm embarrassed by how long it took me to join my local library. I talk big about ethical issues, and although I follow through pretty well on some of them, I've been slack on this. I've bought books rather than hunting them down. Now I'm having fun just browsing what's available and reading things I might not otherwise have found. When I think they might interest you, I'll share a review. 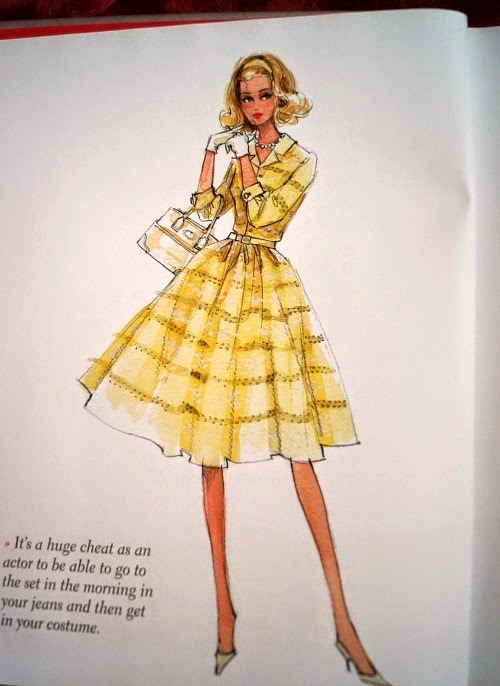 We start with a vintage-skewed fashion advice book. 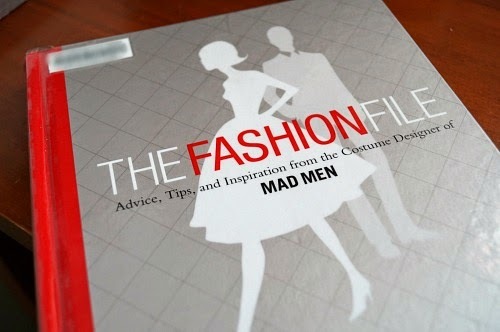 "The Fashion File: Advice, Tips and Inspiration from the Costume Designer of Mad Men"
There is a lot to like about this book. I've read quite a few books that give advice on finding your style and building a wardrobe, but this one still had a lot of unique approaches to offer. Within each chapter, the advice was broken down into many small separate sections, and there were many bonus facts dotted about the place, but the book still managed to be coherent and keep its focus. That focus was always on how to immediately apply the lessons to your own life. Each chapter finished with a "checklist" that summarised the actionable advice. There was a lot of discussion of vintage style, vintage fashion icons and fashion history, but it was all with the aim of incorporating that wisdom into your modern fashionable look. This might not be everyone's cup of tea, but I found it interesting and a fresh perspective compared to other books I've read. The illustrations are gorgeous, and provided in great enough numbers to make browsing through the book a visually pleasant experience, to say the least. 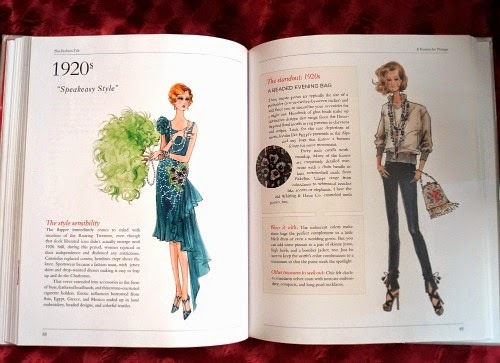 The sections on style icons (there was one of these each for men and women) described each star's main looks and unique qualities, then honed in on the best style lessons to learn from them. Similarly, the look at each decade described the trends of the era, then highlighted a particular vintage item to shop for and how to wear it. For example, the 1920s put the spotlight on beaded bags, discussing what to look for when shopping and outfit ideas to pair them with. This was probably my favourite part of the book, and if they had gone into the same detail for a few more key pieces in each decade, it would have been fantastic. Some other features I liked were the section on promoting and maintaining postive self image, a costume designer's approach to closet arrangement, and advice on "playing dress-ups" at home to prepare looks. The idea of following that last piece of advice makes me feel silly, but the reality is that I never leave myself enough time to get ready, and if I haven't already worked out good pairings from my wardrobe, I end up wearing the same things and generally less daring outfits. I imagine that's true for others too.Maybe I should give it a try. The main negative for me was the lifestyle blindspot. The author clearly lives a glamorous life in a glamorous world, and has very different wardrobe needs to me. So at times, particularly when talking about 'necessary items' to own, the advice was useless to me. I don't mind that as much, but I think it should be at least acknowledged that not everyone's needs are the same. Advice about work clothes that is suitable only to those in office-type jobs is extremely limited, and I need a lot more outfits for going out to a local restaurant for dinner than to a cocktail party or gala event. The other minor niggle, as a fanatic of ethical fashion, were the occasional moments when the values of the book clashed with mine. Neither of these points seriously detracted from what I enjoyed about the book, but I thought I should mention them. Overall, I recommend giving this a read. I feel that while not every section or piece of advice would suit everyone, there is so much variety here that you are bound to find something that you enjoy and learn from. If you've read this book, I'd love to hear your thoughts on it too. Or any other fashion books (vintage or otherwise) that you would recommend. 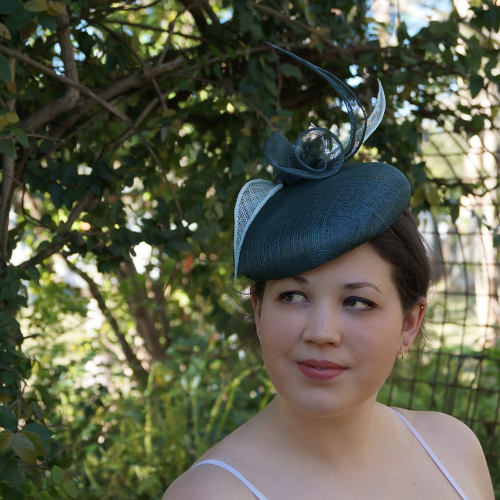 My hat-a-day rate has slowed, but I have added 7 more hats to my online shop, so I thought I'd show them off again. First up, two more hats from my exploration of 1960s faux fur hats. I love the look of the fun cheetah spots, and this grey faux fur is so soft and such a rich colour. My first exploration into sinamay is finally in the shop now too. This one makes me think of eucalyptus leaves, despite the flower, because of the rich dark green and a pale silvery green together. Nothing subtle about this one mini top hat. I was obsessed with carousel animals at the time, and this is my "Carousel Rooster". I love it, but it is quite a bold statement! 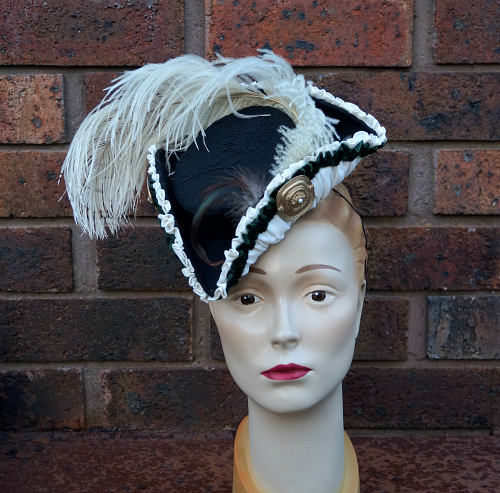 After mini top hats, one of the other fabric-covered hat shapes I had fun exploring was miniature tricornes. I only finished these two off late last year. 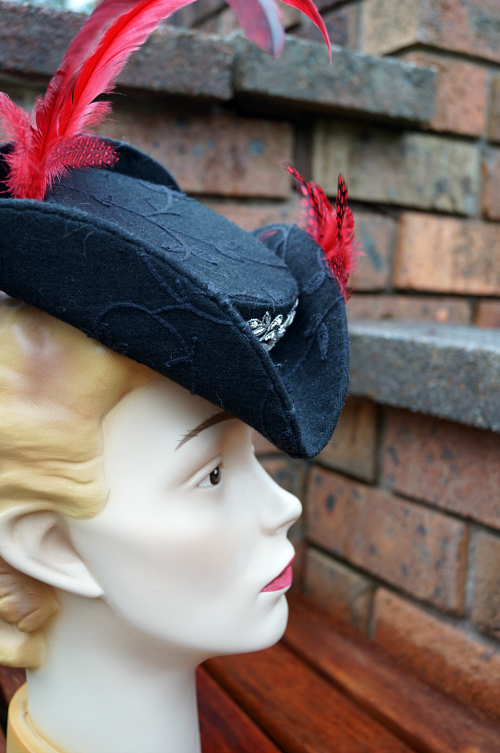 This one in red, black and silver, is called "Lady Maria." And this one is "Countess Charlotte." Mostly black and cream, with highlights of gold and dark green. 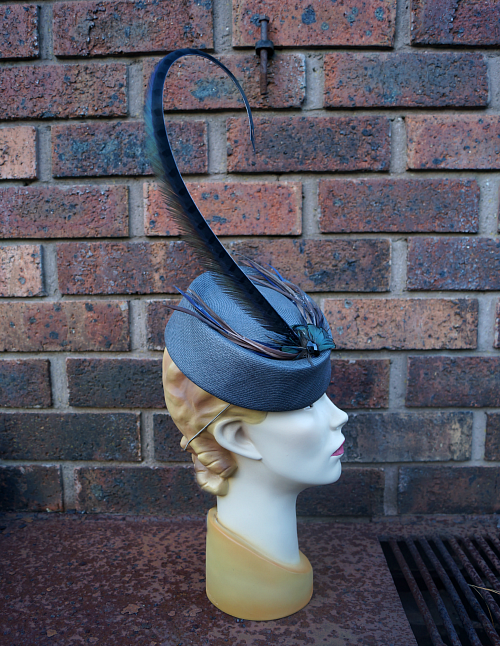 She has a gathered facing, which is one of my favourite finishes for underneath brims. 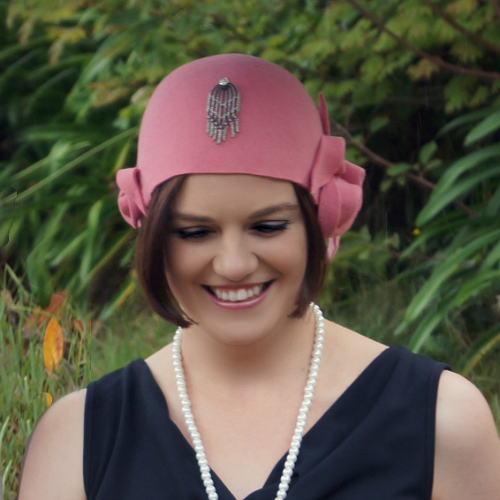 To finish, we have a simple and understated 1920s cloche. No trims, just hand-shaped folds in the felt. I do love this one! Shop updates will be thin for a while as I work on a custom project and getting some hats ready to put into a local shop in just a couple of weeks. It's going to be a busy time! This post makes me happy, as the intersection of such a lot of directions I've been wanting to pursue. Wearing more hats myself, putting more effort into my outfits, chronicling my pregnancy, and refashioning old items into new hats. As a maker of hats, I've been pushing myself to wear them more, but much of what I make is not casual everyday wear suited to my regular life. 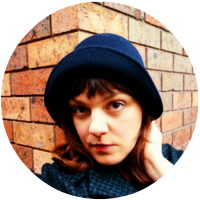 I've started wearing berets a lot, and with winter weather settling in here in the Blue Mountains, I'm happy that I have finally made myself one. 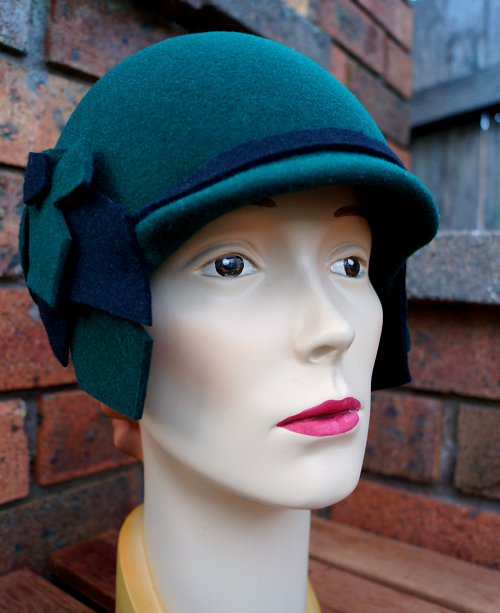 In fact, I'm on a quest to make myself the perfect beret. This is just round one! 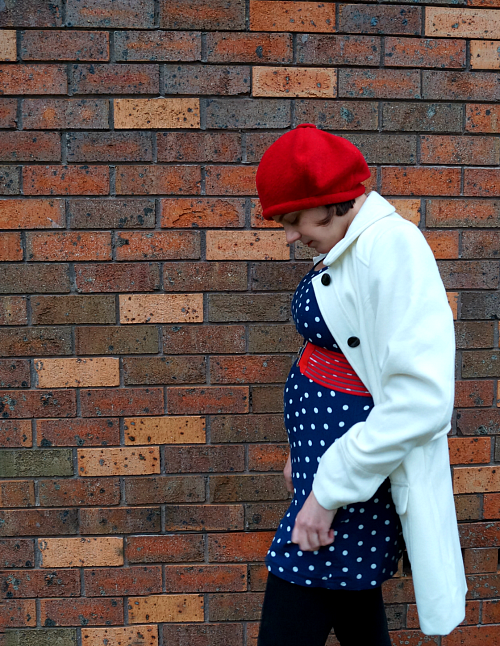 I've combined taking photos of the beret with my first set of maternity photos. The bump looks a lot bigger from up there than it does through the camera lens. 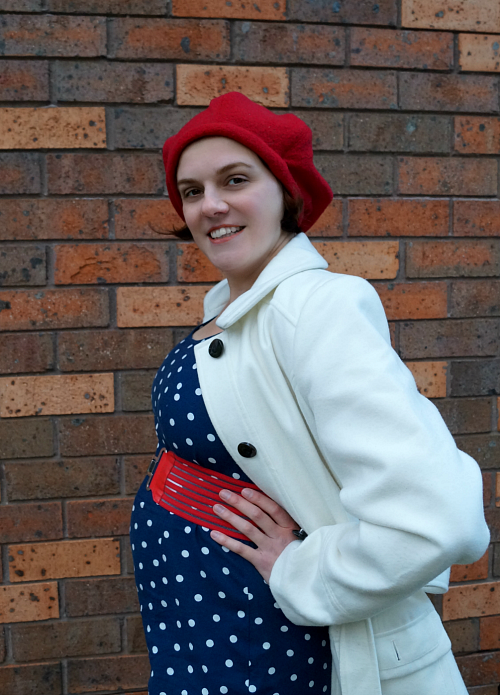 Building a maternity wardrobe has been an exciting exercise. Having to adapt to a new silhouette and different styles than I am used to forces me to think differently about clothes. I also had an excuse to buy a lot of new (to me) clothes at once, and I did the most focused shoppping I've ever done! I actually did some of the activities that are always recommended for building an organised and coordinated wardrobe, like creating a Pinterest board of looks you like, and looking for gaps in your existing wardrobe. 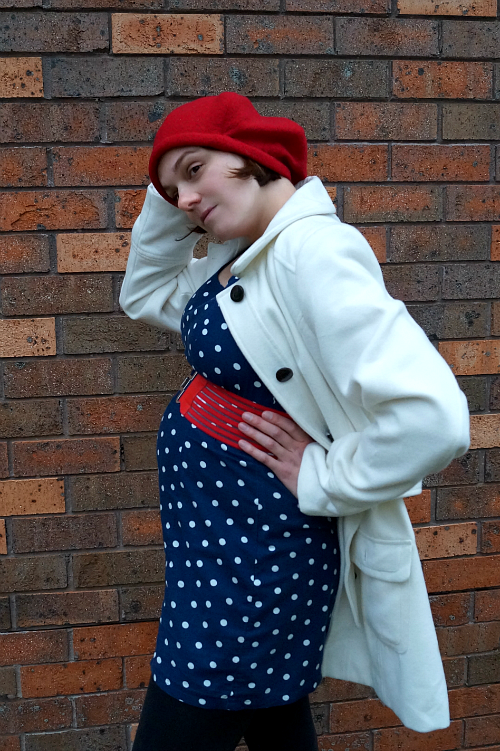 Having said that, this dress I actually bought pre-pregnancy, thinking it might suit a 1960s hat photoshoot. It won't last me for much longer, because it has no stretch, and the extra room it has is close to running out. But I love the cute polka-dots and I love pairing it with red accessories. I had a guiltily-joyful time doing trigonometry to translate the proportions I wanted for my beret into pattern pieces. I drafted the same basic shape in a six-panel and eight-panel pattern, so I will be testing the eight-panel next. I like the overall shape, but I definitely want to tweak it further to be perfectly happy. 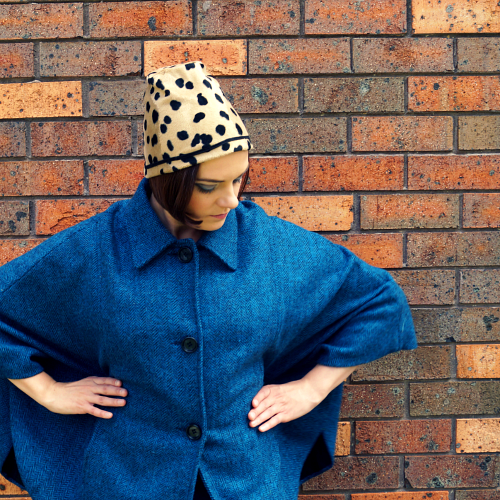 The fabric is a bright red 100% wool fabric that used to be the sleeves of my favourite coat. I feel that in refashion projects, you need to show a truly tragic before photo, so that your final result looks even more impressive. In this case, however, my coat was always lovely. It was just almost worn through at the elbows and starting to thin out in other places too. I wore my red coat almost every cold day for about 6 years, often wearing it all day while teaching in the cold school building! One of my students called me "Miss-with-the-red-coat". Here is my unusually-positive before photo, one of my favourites, from a trip about 4 years ago to the Hunter Valley Gardens. 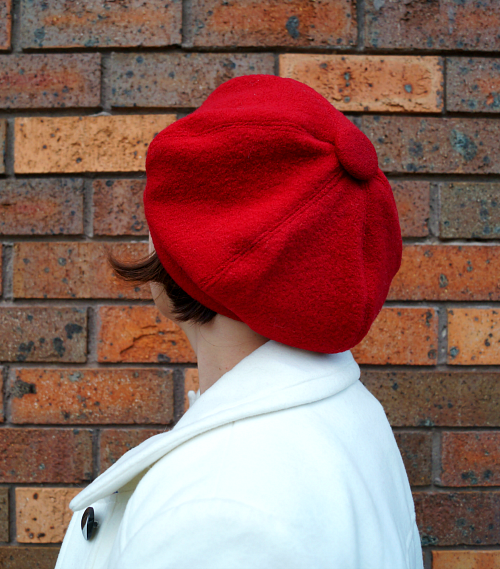 Coincidentally I'm wearing one of my not-made-by-me berets that inspired me to start on my own. 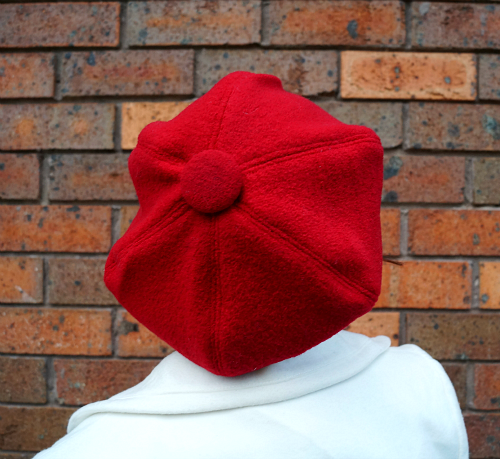 One thing I love about refashions is using bits of existing structure to make features on the new item, like using one of the coat buttons to top off this beret. And, of course, that a piece of clothing I loved so much and wore for so long, gets to stay a part of my wardrobe. By making this just from the sleeves, I have all the rest of the coat to play with! You can probably expect to see more red hats in the future. With my productivity decreased lately, due to my being "in the family way", I seem to have compensated by having plenty of energy for planning and for buying. 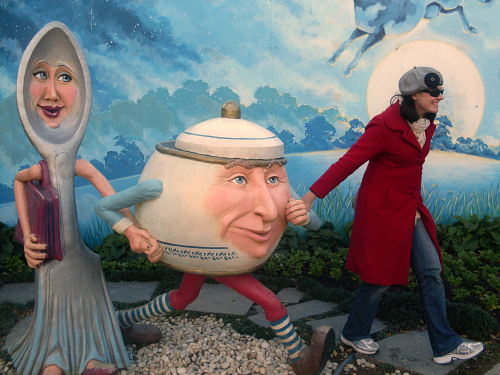 It is easier to consume than create. In all my constant browsing of Lovely Things That I Might Like To Buy, I was very tempted by a large lot of vintage hats in need of repair. 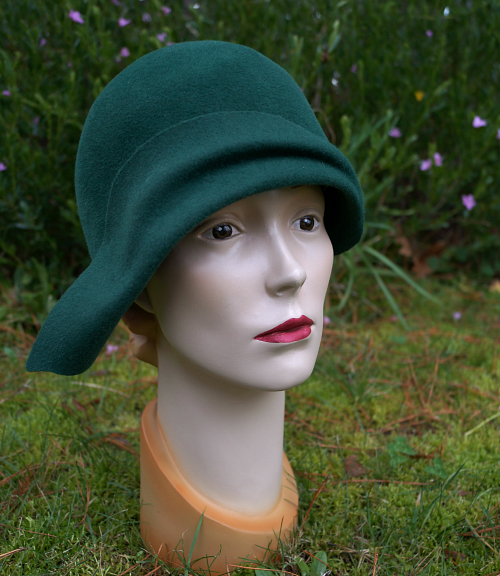 While I didn't originally have any intention of selling actual vintage hats, as I immerse myself in research, I've come to admire and covet them more than ever, and my work on rescuing and restoring the sad unloved hats of the world has come to mean more to me. Expanding that mission appeals to me. But I was strict with myself. It's one thing to say you are too tired to create, but it is another to excuse the fact that I have DOZENS of hats that are made but not listed in my shop. So I set myself a target. 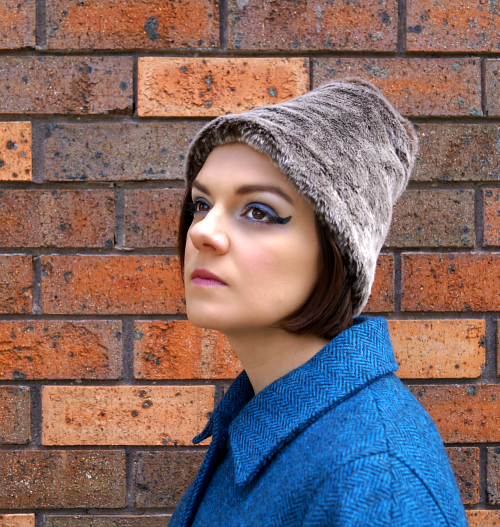 To list one hat in my online shop each day for the next week. And I am rather pleased with myself, because I have achieved it! Both of these featured on the blog last year. 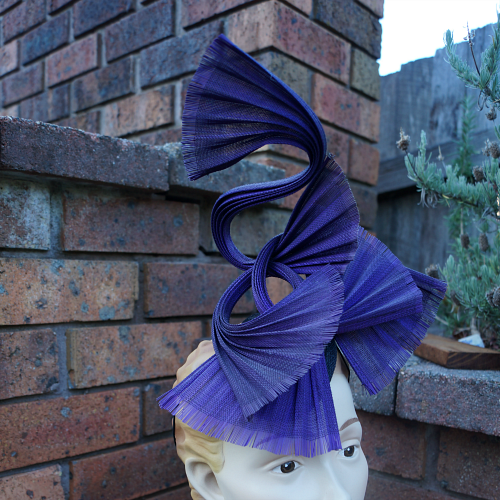 The purple twirls was one of two hats I made while re-exploring jinsin, and the straw hat I began making in England when I did a day of tutoring with Bobbi Heath. These two I showed earlier this year, for my weekend of 1920s fun., but I only just got around to taking some more photos and putting them into the shop. 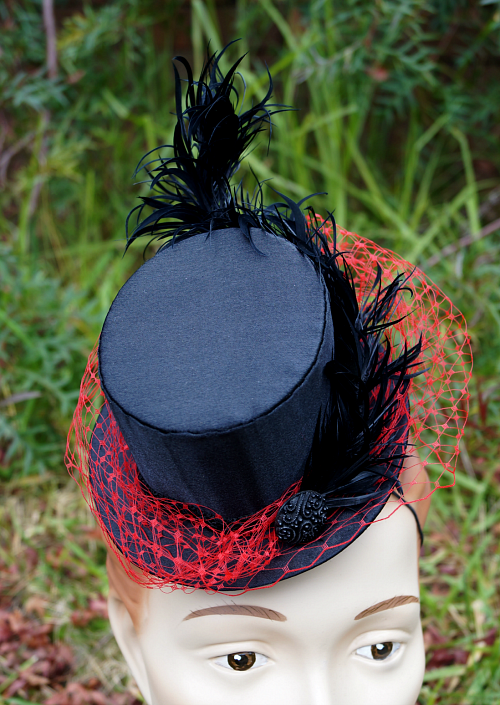 Miniature top hats were the very first type of hat I made properly. I was pretty happy with how they turned out, and all the fun different looks you could achieve with different fabrics and trims, so I made a lot of them! 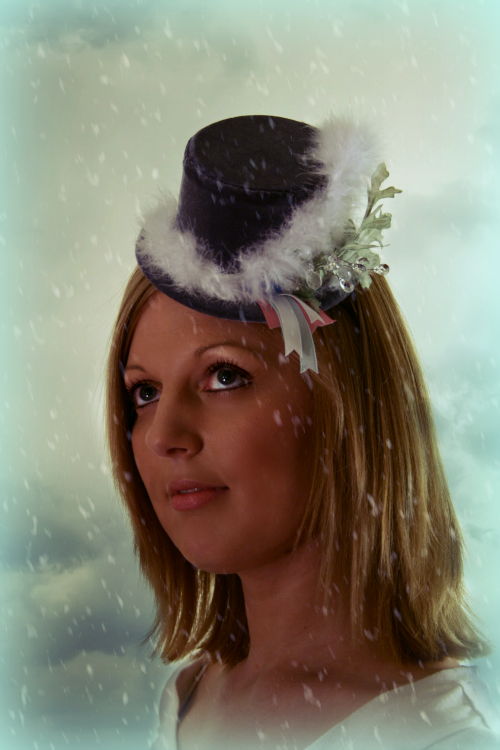 This one is called "Winterwood" (after a Don McLean song) and I couldn't resist editing one of the photos a lot to suit the theme of the hat. 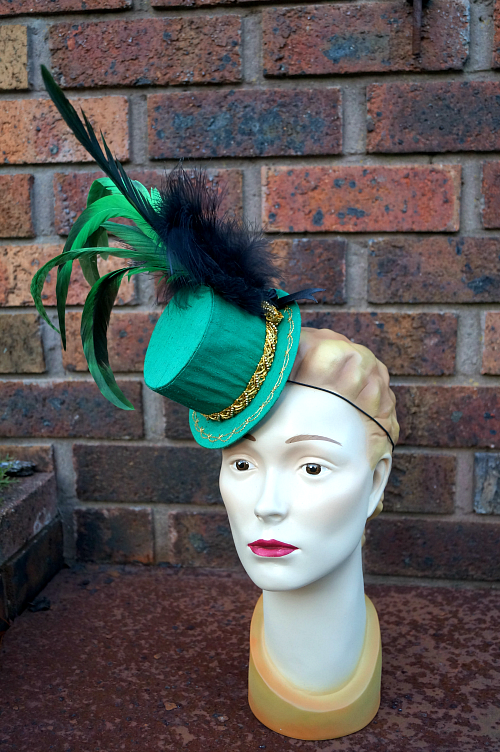 Another of my mini top hats. This one went in a vampiresque direction, possibly on purpose, possibly just because I wanted to use red veiling. And this one I only did a few months ago. It actually started with the intention of a sixties direction with that little "visor" at the front, but when worn, it was looking much closer to the 1920s, so I changed path and added the diamond shapes at the sides. Having achieved my goal, I'm still cautious about whether to claim my "prize" of allowing myself to indulge in the vintage hat purchase. I realised, however, that I have at least 20 more hats made and waiting to be photographed and listed, so I'll keep working away at it, and see how I feel! I'm thinking of celebrating the completion of this task with a giveaway, which will be my first. I'm quite excited by the idea. 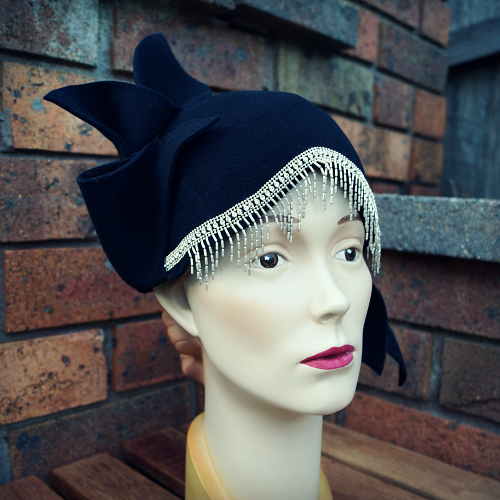 What do you think about adding restored vintage hats to my shop, alongside my own creations?